Makes me wonder why it's not available in Canada. It's clearly marked for your cloths and gear. It has the same active ingredient (Permatherin) and the same strength (.5%) as the Ultra Shield. Hard to imagine Health Canada is very serious about the risks of Lyme disease when products like this are still banned for sale in Canada. Didn't you know that " Big Brother " is looking after us, he/they know what's good or bad for us . They even take simple things like weed and feed fertilizer off the market here in Canada. He's long been calling for greater access to the insecticide in Canada. 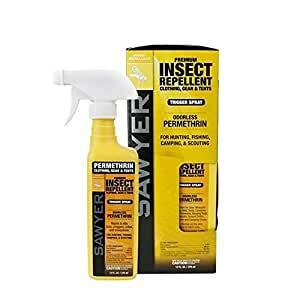 "The important thing about permethrin is that once it's dried into clothing via the processes that these various companies use, it is totally safe, but it's very effective against killing and stunning any kind of insect that gets onto it," Patton said. A recent study in the Journal of Medical Entomology found that permethrin does deter black-legged ticks, and the researchers concluded it was a promising way to tackle Lyme disease. Although permethrin hasn't been widely sold to consumers in Canada, it's been approved for other uses for years, including in military outerwear and for livestock. According to Health Canada, it "may pose a risk to aquatic organisms, bees, beneficial insects and birds." Patton, said the federal government seems to agree with him and Rosbe. It even suggests travellers use permethrin when they're going to areas with high cases of tick-borne illnesses. "Permethrin is known to repel and kill a variety of arthropod or insects and permethrin would be a [welcome] addition to the tool box for repelling ticks," said Robbin Lindsay with the Public Health Agency of Canada in a written statement to CBC News. Years ago my dog got Lyme while using Revolution. Caught it early got her on meds and seemed she was fine. Switched to some other type of tick meds and never found another tick on her. Glad you mentioned that! Folks need to know that REVOLUTION does NOT handle deer ticks in any way.